To Cite: Ghajari H, Hosseini S A, Farsi S. The Effect of Endurance Training Along with Cadmium Consumption on Bcl-2 and Bax Gene Expressions in Heart Tissue of Rats, Ann Mil Health Sci Res. 2019 ; 17(1):e86795. doi: 10.5812/amh.86795. Background: Exposure to environmental pollution is a very important factor that disrupts human metabolism. Cadmium is one of the toxic elements of the environment that has deleterious effects on various organs of the body, induces oxidative stress in the cell, and ultimately causes apoptosis. Objectives: The aim of this research was to investigate the effect of endurance exercise along with cadmium consumption on the expression of Bcl-2 and Bax genes in the heart tissue of rats. Methods: In the present experimental research, 25 rats were randomly selected and divided into five groups of five rats (1) control, (2) sham, (3) cadmium consumption, (4) endurance training along with cadmium consumption, and (5) endurance training alone. Groups 3 and 4 received 2 mg/kg of cadmium per day peritoneally and groups 4 and 5 ran on the treadmill for three sessions of 60 minutes per week for eight weeks. For statistical analysis, Kolmogorov-Smirnov, One-way ANOVA, and Tukey's post hoc tests were used (P ≤ 0.05). Results: Cadmium significantly reduced the Bcl-2 gene expression (P = 0.003) and increased the Bax gene expression (P = 0.001) in the heart tissue of rats. On the other hand, endurance training significantly increased the Bcl-2 gene expression (P = 0.002) and reduced the Bax gene expression (P = 0.002) in the heart tissue of the rats. Conclusions: Eight weeks of endurance training can improve the Bcl-2 and Bax gene expressions in the heart tissue of rats exposed to cadmium. Exposure to environmental pollution is a very important factor that disrupts human metabolism. In this regard, cadmium as a heavy and highly toxic metal that is produced abundantly in industrial and agricultural activities (1) and causes pulmonary, liver, kidney, bone, respiratory, and immune system toxicity and impairs the function of these tissues, as well (2). The acute oral lethal concentration of cadmium has not been recorded for humans, but it would be about a few hundred milligrams (3). Cadmium causes oxidative stress in the cell so that its toxic effects can cause the oxidation of membranes, organelles, or phospholipids, which subsequently leads to cellular dysfunction or apoptosis (4). Apoptosis plays a critical role in monitoring different types of non-pathological events and is a naturally planned biological process for the removal of damaged cells (5, 6). Cells that suffer from apoptosis are characterized by numerous morphological changes, such as cellular shrinkage and contraction, germination of the plasma membrane, organized nucleic rupture, and cellular fragmentation. One of the pathways involved in the induction of apoptosis is controlled by Bcl-2 family members and, by activating Bax, leads to the permeability of the mitochondrial membrane (7). Regarding the effect of exercise on apoptotic indices, it has been shown that in ovariectomized rats, long-term endurance training could significantly decrease Bax, Bad, t-Bid, activated caspase-9, activated caspase-3, and cytosolic cytochrome-C (8). 12 weeks of endurance training with 15% gradient significantly increased the Bcl-2 gene expression in trained rats (5). Three months of exercise on a rats’ special treadmill significantly reduced Bad, Bax, and Bax to Bcl-2 protein ratio, as well as activated caspase-9 and activated caspase-3 (9). Six sessions of one hour per week for 13 weeks of aerobic training significantly increased anti-apoptotic (Bcl-2) gene expression and significantly reduced apoptotic factor (Bax) expression (10). Moreover, regarding the effect of exercise on cadmium toxicity, the research has shown that five sessions of 60 minutes per week for three weeks of swimming endurance training with silymarin consumption reduced the apoptotic indices of pregnant rats poisoned with cadmium, but swimming training had no significant effect on changes in apoptotic indices in pregnant rats poisoned with cadmium (11). Five sessions a week and each session for 60 minutes of swimming endurance training led to a significant increase in the hypoxia-inducible factor (HIF) in the liver of pregnant rats (6). It is inevitable to be aware of the threats of contact with toxic substances and find ways of minimizing their harmful effects. Considering the lack of sufficient information about the effect of endurance training on some apoptotic indices, the aim of this research was to investigate the effect of endurance training along with cadmium consumption on Bcl-2 and Bax gene expression in the heart tissue of rats. To investigate the normal distribution of the findings, the Kolmogorov-Smirnov test was used. For analyzing the findings, the statistical tests of One-way ANOVA and Tukey’s post hoc were employed (P ≤ 0.05). Bcl-2 and Bax gene expression levels are shown in Figures 1 and 2. The results of One-way ANOVA in Table 1 showed significant differences in the Bcl-2 (F = 16.12, P = 0.001) and Bax (F = 52.97, P = 0.001) gene expression levels between the five groups of rats. The results of Tukey's post hoc test in Table 2 showed that there was no significant difference between the Bcl-2 gene expression level of the control group and those of the sham group (P = 0.95) and endurance training with cadmium consumption group (P = 0.99). However, the Bcl-2 gene expression was significantly lower in the cadmium consumption group than in the control group (P = 0.003), but it was significantly higher in the endurance training group than in the control group (P = 0.01). The Bcl-2 gene expression was significantly higher in the endurance training group than in the cadmium (P = 0.001) and endurance training with cadmium consumption groups (P = 0.02). 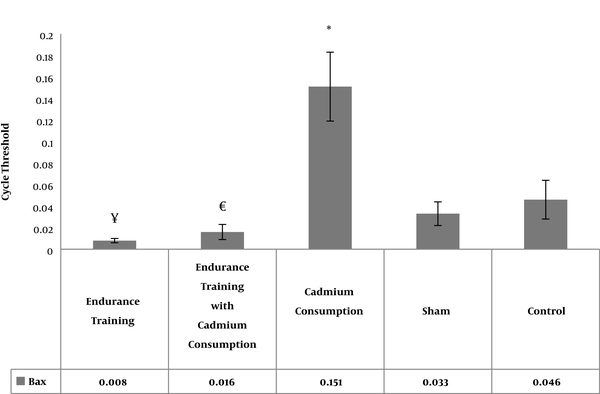 The Bcl-2 gene expression in the endurance training with cadmium consumption group was significantly higher than that of cadmium consumption group (P = 0.002). In addition, the results of this test showed that there was no significant difference between the Bax gene expression of the control group and those of the sham (P = 0.75) and endurance training with cadmium consumption groups (P = 0.08). However, the Bax gene expression was significantly higher in the cadmium consumption group than in the control group (P = 0.001), but it was significantly lower in the endurance training group than in the control group (P = 0.01). The Bax gene expression was significantly lower in the endurance training group than in the cadmium consumption group (P = 0.001). 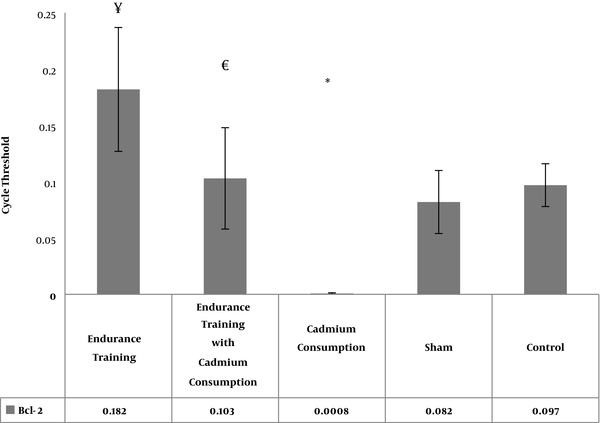 However, there was no significant difference in the Bax gene expression between endurance training group and endurance training with cadmium consumption group (P = 0.94) and the Bax gene expression of the endurance training group with cadmium consumption was significantly lower than that of the cadmium consumption group (P = 0.002). Figure 1. Bcl-2 gene expression in the heart tissue of rats in research groups. * A significant increase in the cadmium consumption group compared to the control group. € A significant increase in the endurance training with cadmium consumption group compared to the cadmium consumption group. ¥ A significant increase in the endurance training group compared to the control group. Figure 2. Bax gene expression in the heart tissue of rats in research groups. * A significant increase in the cadmium consumption group compared to the control group. € A significant reduction in the endurance training with cadmium consumption group compared to the cadmium consumption group. ¥ A significant reduction in the endurance training group compared to the control group. The findings of the study showed that endurance training increased Bcl-2 gene expression and reduced Bax gene expression in rats. It has been noted that apoptosis can be a multi-stage and program-dependent process (15). Various intracellular portions, including the plasma membrane, Golgi complex, mitochondria, and nucleus, are some molecules that are involved in the apoptosis program. Physical activity through the mitochondrial pathway can improve apoptosis in the heart of rats. It seems that physical activity by reducing ROS and preventing the resulting loss of cytochrome C within mitochondria is beneficial in reducing cardiac apoptosis (15). Consistent with the present study, Sharafi and Rahimi's study in 2012 indicated that a resistance training session with 80% of one RM could be effective in regulating and preventing apoptosis (16). Huang et al. in 2016 showed that the levels of activated caspase-3, activated caspase-9, cytosolic cytochrome-C, t-Bid, Bax, Bad, and Bak significantly reduced in ovariectomized rats and trained rats (8). Jafari et al. showed that 12 weeks of endurance training with a 15% gradient increased Bcl-2 gene expression and reduced Bad, Bak, and Bax in rats (5). In 2012, Lee et al. showed that the protein levels of Bax to Bcl-2, Bax, and Bad were lower in trained Zucker rats than in untrained rats (9). In 2014, Santana et al. showed that after 13 weeks of aerobic training, the expression of mRNA of the Bad gene significantly reduced, but its protein reduction was not significant. In addition, the results showed that exercise significantly increased the (Bcl-2) anti-apoptotic genes expression and significantly reduce the (Bax) apoptotic factor gene expression (10). The results of this study showed that cadmium consumption significantly decreased the Bcl-2 gene expression and increased the Bax gene expression in rats. On the other hand, endurance training in cadmium-infected rats increased the Bcl-2 gene expression and decreased the Bax gene expression in rats when compared to the cadmium consumption group. Cadmium with high oxidative stress capacity induces apoptosis in human and animal cells (17). This study was consistent with some other studies. In the studies by Mirdar et al. (6) and Meydar et al. (11), it was shown that receiving 1, 2, and 4 mg/kg of body weight cadmium resulted in a significant reduction in the Bcl-2 expression and a significant increase in Bax of rats. In addition, they declared that the increase in apoptosis induced by cadmium is probably due to mitochondrial targeting. The main pathway for increasing mitochondrial-dependent apoptosis is based on the activity of caspases mediated by the continuous release of mitochondrial cytochrome C. Following various pressures leading to the release of Ca2+ ions from the endoplasmic network, mitochondria play an important role in the collection of these cytosolic calcium ions. In fact, the rapid release of Ca2+ from the endoplasmic lumen implies the permeability of the mitochondrial membrane and stimulates the apoptotic responses. Mitochondria are the main actor in the apoptosis process, and this is done through the integration of death signals by proteins belonging to the family of cell B lymphoma (11). Controlling the transfer of proteins through the endoplasmic-Golgi network secretion pathway or the accumulation of unfolded proteins in response to stressors leads to their competitive binding to the ER lumen chaperones, Bip/GRP 78 (binding protein)/(73 kDa glucose-regulated protein). This issue causes chaperone displacement and separation from serine-threonine Ire-1α kinase existed on the ER membrane, which allows the kinase to dimerize and phosphorylate its cytosolic trace (autophosphorylation). Then, the cytocellular part of this kinase, by presenilin-1 (PS-1), undergoes a proteolytic breakdown and is transmitted to the nucleus, where it is specified to increase the transcription of ER chaperones (such as Bip and calreticulin) and the transcription factor CHOP/GADD 153 (C/EBP homologous protein)/(growth arrest and DNA Damageinduciblegene 153). The transcription factor CHOP/GADD 15332 reduces the Bcl-2 gene expression and leads to the initiation of mitochondrial apoptosis (7). Regarding the effects of exercise on cadmium-induced apoptotic indices, some studies have suggested that submaximal endurance training by modulating the negative effects of cadmium in the body can protect the heart tissue (14). In addition, Mirdar et al. in a study on cadmium-poisoned pregnant rats found that performing endurance training lad to a significant reduction in cadmium levels in the body of this species (18). This means that the duration and intensity of aerobic exercise in the present research (with moderate intensity and relatively long duration) were important factors in the improvement of apoptotic indices in the heart tissue. In another study, Mirdar et al. stated that swimming training could have positive effects on cadmium-induced liver apoptotic indices, and swimming sport somewhat could counteract cadmium-induced apoptosis (6). On the other hand, there is a discrepancy between the present study and the study of Olah et al. in which they reported that three hours of compulsory swimming induced an increase in the Bax to Bcl-2 ratio and the mitochondrial matrix system impaired by acute exhaustive exercise (19). Among the reasons for incompatibility of the mentioned study with the present study, we can point to the intensity and duration of the training in the studies, which included eight weeks of moderate intensity training in the present study while in Olah et al.’s study, it comprised one session of high- intensity resistance training. Some of the limitations of this research were the lack of measurement of cadmium uptake and the lack of control of animal's nocturnal activities. In the present study, despite the existing limitations, endurance training could improve cadmium-induced apoptosis. Therefore, the controlled review of inexpensive, safe, non-pharmacologic strategies such as physical activities, especially in the presence of other pollutants in animal species in a longer term, can be effective as fundamental research to be considered for human research in the future. Regarding the results of the present study, it appears that eight weeks of endurance training result in the improvement of Bcl-2 and Bax gene expressions in the heart tissue of rats exposed to cadmium toxicity. Because this study is an excerpt of a Ph.D. dissertation approved by the Islamic Azad University of Larestan Branch, the spiritual support of the Department of Research of the University is sincerely appreciated. Funding/Support: This work was funded by the Islamic Azad University of Larestan Branch. 1. Zhou Z, Lu YH, Pi HF, Gao P, Li M, Zhang L, et al. Cadmium exposure is associated with the prevalence of dyslipidemia. Cell Physiol Biochem. 2016;40(3-4):633-43. doi: 10.1159/000452576. [PubMed: 27898410]. 2. Asgharzade Oliaei HA, Mirdar Harijani S, Mousavi N. [The effects of a submaximal endurance swimming training period and cadmium poisoning during pregnancy on the hepatocyte growth factor response in neonatal rats]. Qom Univ Med Sci J. 2015;9(1):38-45. Persian. 3. Cheraghi M, Kargar A, Lorestani B, Tabiee O. [Determination of cadmium, nickel, lead and vanadium concentrations in white Indian prawn sold in Shiraz town]. J Shahrekord Univ Med Sci. 2014;16(4):54-61. Persian. 4. Mahdavi Lefmajani S, Khandahmi P, Hayati Roodbari N. [Effects of intraperitoneal administration of cadmium on apoptotic bcl-2 and Bax genes expression in rat hippocampal cells]. Mod Genet J. 2014;12(1):81-9. Persian. 5. Jafari A, Pourrazi H, Nikookheslat S, Baradaran B. Effect of exercise training on Bcl-2 and bax gene expression in the rat heart. Gene, Cell and Tissue. 2015;2(4). doi: 10.17795/gct-32833. 6. Mirdar S, Hedayati M, Hajizade A. [The effect of endurance swimming exercise on hif-1 levels in livers of pregnant rats exposed to cadmium toxicity]. J Rafsanjan Univ Med Sci. 2014;12(11):919-28. Persian. 7. Montazeri F, Rahgozar S, Ghaedi K. Apoptosis and cytosolic organelles. Genet 3rd Millennium. 2011;9(1):2300-12. 8. Huang CY, Lin YY, Hsu CC, Cheng SM, Shyu WC, Ting H, et al. Antiapoptotic effect of exercise training on ovariectomized rat hearts. J Appl Physiol (1985). 2016;121(2):457-65. doi: 10.1152/japplphysiol.01042.2015. [PubMed: 27339185]. 9. Lee SD, Shyu WC, Cheng IS, Kuo CH, Chan YS, Lin YM, et al. Effects of exercise training on cardiac apoptosis in obese rats. Nutr Metab Cardiovasc Dis. 2013;23(6):566-73. doi: 10.1016/j.numecd.2011.11.002. [PubMed: 22402061]. 10. Santana ET, Serra AJ, Silva Junior JA, Bocalini DS, Barauna VG, Krieger JE, et al. [Aerobic exercise training induces an anti-apoptotic milieu in myocardial tissue]. Rev Educ Fis. 2014;20(2):233-8. Spanish. doi: 10.1590/s1980-65742014000200015. 11. Meydar S, Mousavi N, Hamidian G, Hedayati M. [The effect of swimming endurance training on apoptotic index changes and liver metallothionein concentration in pregnant rats exposed to cadmium poisoning]. Appl Life Sci Sports. 2013;1(2):9-20. Persian. 12. Probst GS, Bousquet WF, Miya TS. Correlation of hepatic metallothionein concentrations with acute cadmium toxicity in the mouse. Toxicol Appl Pharmacol. 1977;39(1):61-9. doi: 10.1016/0041-008x(77)90177-6. 13. Agha-Alinejad H, Haftchenari S, Matin Homaee H. [Effect of a period of endurance training on serum Il-8 concentration and tumor volume in breast cancer bearing mice]. Iran J Endocrinol Metabol. 2014;16(1):26-32. Persian. 14. Bedford TG, Tipton CM, Wilson NC, Oppliger RA, Gisolfi CV. Maximum oxygen consumption of rats and its changes with various experimental procedures. J Appl Physiol Respir Environ Exerc Physiol. 1979;47(6):1278-83. doi: 10.1152/jappl.1979.47.6.1278. [PubMed: 536299]. 15. Razavi Majd Z, Matin Homaee H, Azarbayjani MA, Farzanegi P. [Effects of concurrent regular aerobic training and garlic extract on cardiac tissue apoptosis markers in aged rats with chronic kidney disease]. J Med Plant. 2017;2(62):46-54. Persian. 16. Sharafi H, Rahimi R. The effect of resistance exercise on p53, caspase-9, and caspase-3 in trained and untrained men. J Strength Cond Res. 2012;26(4):1142-8. doi: 10.1519/JSC.0b013e31822e58e5. [PubMed: 22446679]. 17. Al-Azemi M, Omu FE, Kehinde EO, Anim JT, Oriowo MA, Omu AE. Lithium protects against toxic effects of cadmium in the rat testes. J Assist Reprod Genet. 2010;27(8):469-76. doi: 10.1007/s10815-010-9426-3. [PubMed: 20455018]. [PubMed Central: PMC2941593]. 18. Mirdar S, Arab A, Hedayati M, Hajizadeh A. [The effect of a course of swimming training program on the levels of lung hypoxia induced invasion of newborns in pregnant rats]. Qom Univ Med Sci J. 2013;7(3):11-20. Persian. 19. Olah A, Nemeth BT, Matyas C, Horvath EM, Hidi L, Birtalan E, et al. Cardiac effects of acute exhaustive exercise in a rat model. Int J Cardiol. 2015;182:258-66. doi: 10.1016/j.ijcard.2014.12.045. [PubMed: 25585360].